Dr Shigeaki Hinohara dreamed of an organisation that would support hospice workers in Asia. He is now the Patron of the APHN. It was Dr Hinohara who, as Chairman of the Life Planning Centre in Tokyo, invited delegates to Japan for the discussions from which the Asia Pacific Hospice Palliative Care Network evolved. This extraordinary man was and is a mentor for many all his life. Retired physicians, who were medical students when Dr Hinohara was already a respected cardiologist, say they remember him well and that he does not seem to have changed over all these years. Dr Hinohara, who will be in his 100s this year, is still fit and working harder than most of us. In 2004 he told Ginko Kobayashi, a reporter for the Daily Yomiuru newspaper, that he does not necessarily subscribe to the theory that one must follow a regular daily routine to stay healthy. It is not uncommon for him to stay up until 5 am to write, sleep for an hour and then get up, drink a glass of milk and a cup of coffee before going about his appointments for the day. He still keeps a 5 year diary! 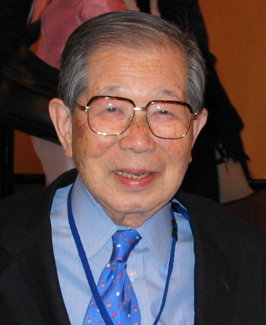 In the past 70 years, Dr Hinohara has written more than 3,200 medical papers and over 300 books. A best seller that has sold more than a million copied “How to Live Well” earned him the status as Japan’s guru of healthy aging. In 2000, he started the “New Old People’s Movement” for seniors over 75. His message is that if you keep working, if you keep learning something new, you’ll never grow old. Recently, he decided to take up golf because he finally had some spare time! Born in 1911 in Yamaguchi Prefecture, he decided to become a doctor after family doctor saved the life of his mother. However, his other love has been music and in 2000, he became the successful scriptwriter of a musical for children based on the book “The Fall of Freddie the Leaf”. In 1990 when Dr Hinohara visited the Cottage Hospice in Perth, Western Australia, he was so impressed by the building that he invited the architect to build the Peace House Hospice, Japan’s first independent hospice, on a beautiful hilltop site facing Mount Fuji in Kanagawa Prefecture. Dr Hinohara heads five foundations, in addition to being the President of St Luke’s International Hospital in Tokyo. He still visits the hospital each day and makes a round of his patients. Dr Hinohara believes that life should be lived to the fullest and that we should strive towards actualising our full potential. His father, a Christian clergyman gave him excellent advice: “Have big visions and put such visions into reality with courage. The visions may not be achieved while you are alive, but do not forget to be adventurous. Then you will be victorious. “It is this vision and spirit of adventure that have brought into being the Asia Pacific Hospice Palliative Care Network. We are very grateful and proud to have Dr Shigeaki Hinohara as the Patron of APHN.